Find out what industry publications say about Devil’s in the Details and its founder, Selvis Morales, CMP. As a guest writer in the online magazine edition of illinois meetings + events, Devil’s in the Details LLC founder Selvis Morales, CMP explores quirky and unconventional locations to host holiday events. Devil’s in the Details LLC submissions for Best in Show 2018 won “Insanely Innovative Meeting Space” and “Best Venue for Small Meetings” categories in PCMA’s Convene Magazine. 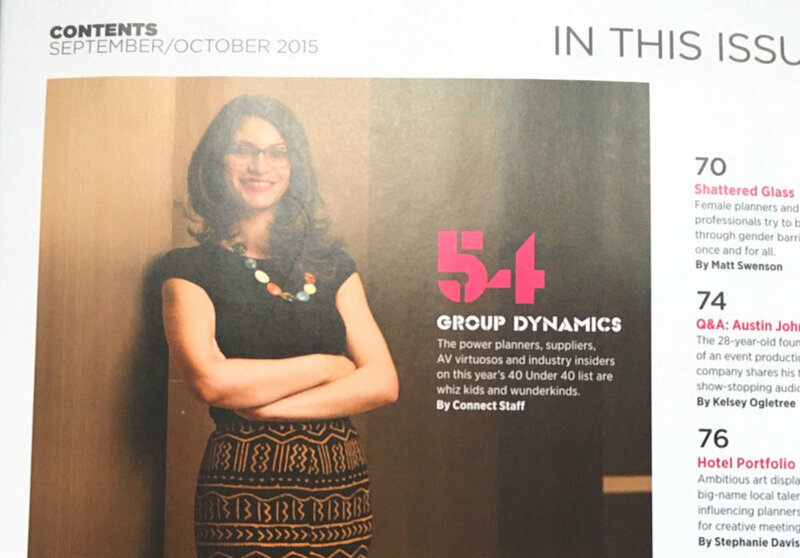 Selvis Morales, CMP was featured as a 40 Under 40 event planner to keep an eye on in the industry magazine Connect in its Fall 2015 publication. Event planning can be tricky, especially to the newly initiated. With that in mind, Devil’s in the Details founder Selvis Morales, CMP started her very own YouTube Channel geared to video tutorials with insights and tips for both professional and amateur event planners. Here’s a glimpse! SEE WHY YOUR LAST EVENT WAS A BUST. Find out why registration numbers dipped at your last corporate or nonprofit event. Watch this video to find out the 3 likely reasons your members, clients and stakeholders failed to sign up and decreased your registration figures. SEE WHY YOUR LAST PARTY WAS A BUST. Find out why no one showed up to your last party and watch this video to find out the 3 likely reasons your friends and family ditched your invite.